The Federación de Fútbol de Chile is the second oldest South American federation, having been founded in Valparaíso on June 19, 1895. Chile is one of the four founding member nations of CONMEBOL. Together with Argentina, Brazil, and Uruguay, the four competed in the first South American Championship, later to be renamed the Copa América, in 1916. On October 12, 1926, Chile made the first corner-kick goal in Copa América history in a match against Bolivia. The best Chilean result in the World Cup was third place in 1962, as the host nation. Chile lost 4–2 to eventual champion Brazil in a semi-final but went on to defeat Yugoslavia 1–0 to earn third place. Chilean players made two World Cup firsts: the first player to miss a World Cup penalty kick was the Chilean Guillermo Subiabre, in a 1930 FIFA World Cup match against France, and Carlos Caszely of Chile became the first player to be sent off with a red card, during a match against West Germany at the 1974 World Cup. On July 19, 2007, the Chilean Football Federation banned six of the national team players, because of "internal indiscipline" during the Copa América tournament, for 20 international matches each and none of the players will ever be allowed to captain the national team. The players banned were captain Jorge Valdivia, defenders Álvaro Ormeño, Rodrigo Tello, Jorge Vargas, Pablo Contreras and striker Reinaldo Navia. Nelson Acosta's resignation as manager came after Chile were knocked out of the 2007 Copa América. Chile had qualified to the quarter-finals after a 3–2 win against Ecuador, and a 0–0 draw against Mexico. But two losses, one of those being a 6–1 defeat against Brazil, sealed Acosta's fate. Former Argentina manager Marcelo Bielsa was given the task of becoming the Chile national team manager in preparation for the 2010 World Cup qualifiers. On October 16, 2008, Chile beat Argentina 1–0 for the first time in a qualifying competition, making history. Marcelo Bielsa was acclaimed for this accomplishment by both Chilean and Argentinian people. This match was seen as one of the reasons that ended Alfio Basile's tenure as Argentina's coach. With Sampaoli, Chile were able to qualify for 2014 FIFA World Cup, reaching to the round of 16, where Chile lost to Brazil in penalties. In the 2015 Copa América, Chile won their first game against Ecuador, with 2-0 being the score. In their second game, Chile drew against Mexico. Chile advanced to the knockout stage as Group A winners with 7 points and most goals scored of any team in the tournament (10). Then they beat Uruguay in the quarterfinals and Peru in the semifinals. In the final, Chile defeated Argentina on penalties after a 0-0 draw, to win their first Copa America title. The team kit consists of a red jersey, blue shorts, and white socks. The away jersey features a white jersey, white shorts, and blue socks. The color scheme of red, white, and blue that was featured in the 1947 South American Championship, the precursor of the Copa América, has remained in place since. Puma company ended its link after the Copa America 2015 with the tender for the new brand that will outfit the team since August 2015. This procedure was won by the American company Nike. Thus, the brand will be responsible for all the costumes of the selection once the Copa America ends. The contract with Nike last until the 2022 FIFA World Cup. The Chilean national team plays their qualifying matches at the Estadio Nacional Julio Martínez Prádanos located in Santiago, Chile and can be found at the commune of Ñuñoa. The construction of the stadium began in February 1937, and opened on 3 December 1938. The current official registered capacity is of 49,000 spectators, but has surpassed the 75,000 mark on many occasions when the match is of high demand. An example would be the 1962 FIFA World Cup semi-final match Chile vs. Brazil, where over 76,000 spectators viewed the game. The maximum attendance ever was 85,262 on December 26, 1962 for a game between Universidad Católica and Universidad de Chile. Chile not share a big rivalry with other country, nevertheless, 2 matches are considered important, those are against Peru, and Argentina. The match with Peru, which is described in Spanish as Clásico del Pacífico, is one of top ten football rivalry in the world according to CNN's Greg Duke. Chile first meeting with Peru dated back in 1935 which Peru won 1-0. The two countries traditionally compete with each other over the rank of fourth-best national team in South America (after Argentina, Brazil, and Uruguay). They also both claim to have invented the bicycle kick; Peruvians call it the chalaca, while it is the chilena in Chile. 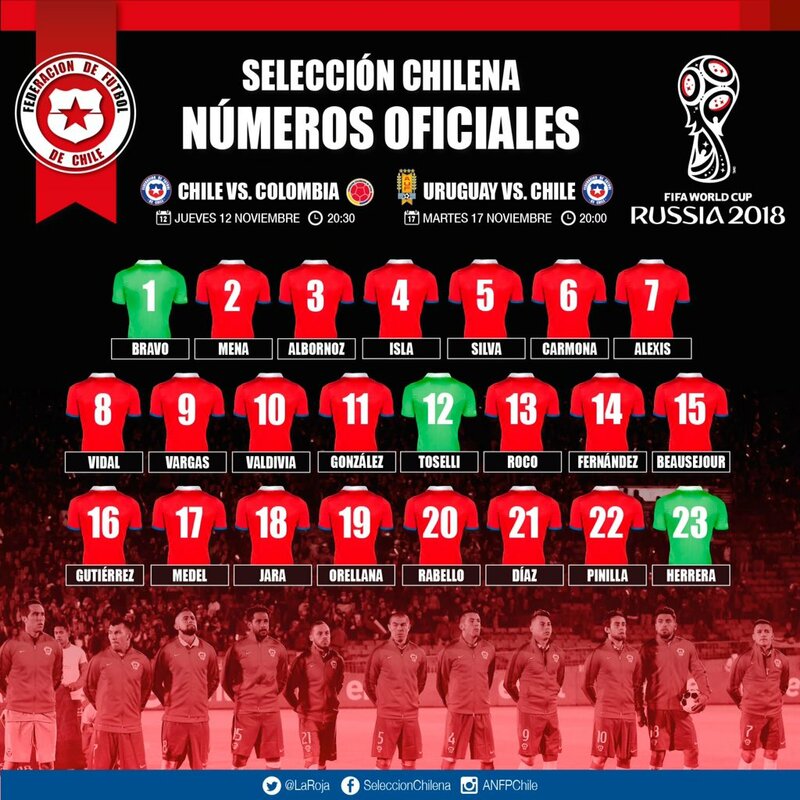 The following 23 players were called up for the 2018 FIFA World Cup qualification matches against Colombia on November 12 and Uruguay on November 17, 2015. Caps and goals updated as of November 17, 2015 after the match against Uruguay. Claudio Bravo is the most capped player in the history of Chile with 97 caps. Marcelo Salas is the top scorer in the history of Chile with 37 goals. In 2010, Chicago-based rock band Manwomanchild released the song "Chile La Roja" in support of Chile's 2010 World Cup team. This page was last modified on 13 January 2016, at 21:17.